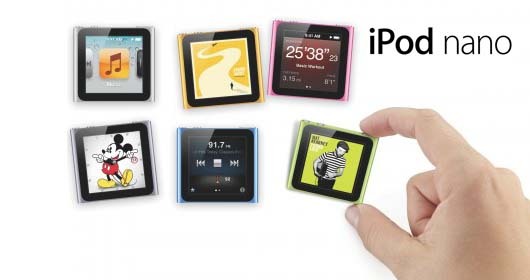 In addition to today’s major announcement about the iPhone 4S, Apple has also revealed updates to the iPod Nano, along with a considerable price cut. The new nano features major UI upgrades in line with the rest of the iPod range, with the ability to run iOS 5 with ‘large icons’ – helping to reduce small-screen-squinting. This feature will enable you to swipe from icon to icon, one at a time. The iPod Nano is also now Nike+ ready straight out of the box. Users no longer need to buy the Nike+ accessory kit separately, with a built-in pedometer able to track run distance, pace and time. 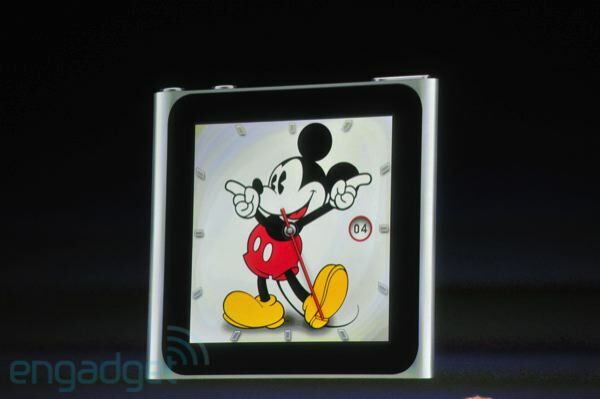 The updated iPod Nano features 16 new clock face designs, further facilitating users ability to use the device as a watch, including a Mickey Mouse analog-imitation (see below). The nano will be available in a choice of 7 colors – blue, green, red, orange, pink, silver and graphite. Both the 8GB and 16GB iPod Nano’s have received a price cut, with the 8GB model now $129 down from $149, and the 16GB model $149 down from $179. Both are available starting today.